Last year marked the 150th anniversary of the London Underground, and there were plenty of special events, commemorative gifts, celebratory ramblings and features to celebrate. In fact, such was the enthusiasm around the event, the general tendancy to complain about delayed trains, overcrowding and ticket prices on the Tube was (momentarily, at least) forgotten. But which past are we referring to? Like anything else, there is always more than one narrative of the past to consider. For all the focus on the Tube itself, something I have always found fascinating about transportation networks is their relationship with the city they serve. On one level, there is the obvious symbiotic relationship between a network constructed to serve flows of people, and the people themselves who in turn respond to the existence and growth of the network. The development of Metroland in the 1930s is one historic example, but more recently the London Overground demonstrates how investment can also spur latent demand by offering new journey possibilities, frequent services and a safe environment. However, at a more fundamental level the experiences of people who use the network are brief moments like that shown in the image above, usually lost in time and forgotten (unless in the case of an exceptionally bad delay such as the 2003 London power cut). In the case of the London Underground, its past is not only the history of the network itself, but the experiences of those who travelled on it. 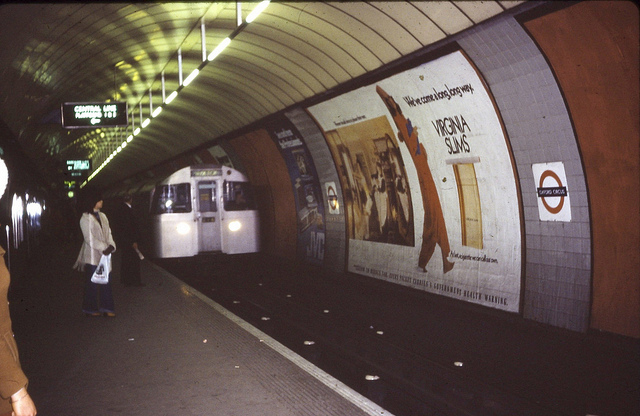 That is what makes this exhibition of Bob Mazzer’s photographs, taken on the Underground in the 1980s so intriguing. 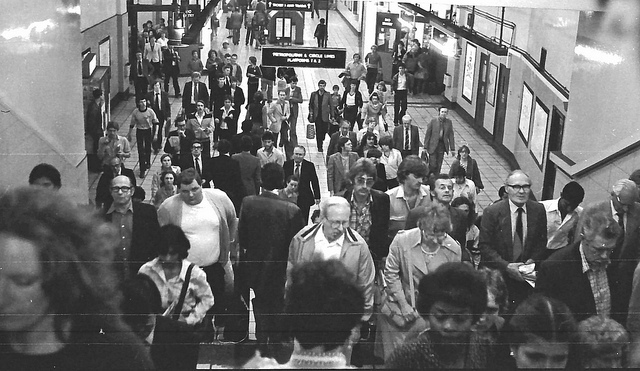 Recently featured on Annie Mole’s Going Underground Blog, they offer a fascinating glimpse of London’s social history through the lens of a commuter at the time. The exhibition runs until 13th July at the Howard Griffin Gallery, 189 Shoreditch High St, London, E1 6HU. I will certainly be making the effort to go and see it.